When you’re looking to buy a premium watch at the sub-$1000 price range, there aren’t many brands that do a good job of balancing quality and affordability. In my years of experience as a watchmaker, I’ve only seen a handful of brands that actually provide quality timepieces which are balanced and do well in terms of style, accuracy, and durability. While a majority of them are Swiss made, Bulova is one of the few non-Swiss watchmakers that provide outstanding quality watches at a fairly affordable price range. I personally own a few of Bulova’s mid-range (as well as top-end) timepieces, and I have to say that they are surprisingly good at crafting some beautiful looking watches that are also durable and highly functional. Bulova is a brand that has a rich history of adept craftsmanship. In fact, the company is responsible for some of the most beautiful specimens of watchmaking in recent times. The history of Bulova is quite a fascinating one, spanning nearly a hundred and fifty years. The brand was founded by a man named Joseph Bulova way back in 1875 in New York City. Joseph Bulova was a Czech immigrant who had a knack for jewelry making, and expertise in the art carried over into his watchmaking career. He started off his watchmaking career in the early 1900s, primarily creating boudoir and pocket watches before finally expanding into the wristwatch market which was the latest buzz back then! Bulova’s incredibly artistic and fashionable watches quickly gained a lot of attention, and by 1912, the company had to set up their first plant in Bien, Switzerland dedicated entirely to producing watches. The first line of fully jeweled wristwatches by Bulova was introduced in the year 1919 which was a massive success for the brand. The iconic visual style of Bulova’s advertising and the highly fashionable watches made the company a raging hit with American Public. Today, Bulova is recognized as one of the finest makers of luxury timepieces across the world, with a diverse range of premium and precise timepieces that will suit the needs of all occasions! As a watchmaker, it is a brand that is quite close to my heart. Not only because it’s American, but there’s just something about their watchmaking style that clicks nicely with my own sense of fashion. I believe they have just the right mix of old-school masculine charm alongside a modern sophistication that is hard to find in the mid-range collections of most brands. They also have one of the most extensive and refined collections of watches for women, and quite frankly, my wife absolutely loves them. With a huge selection of men’s and women’s contemporary styles, I’m sure you’d find one that matches your tastes. Being in the industry for nearly 150 years, Bulova does have a huge selection of models and ranges to suit all kinds of price-points and style requirements. I personally own an Oceanographer “Devil Diver”, a chronograph from their Precisionist Series and an old model from their legendary Accutron series. Although their Accutron series was pulled out of the market a few years back, the Precisionist series has done a tremendous job at keeping the company’s legacy alive. So, we’ll talk a bit about both the Oceanographer and the Precisionist Series – two of their finest range of watches in my opinion. 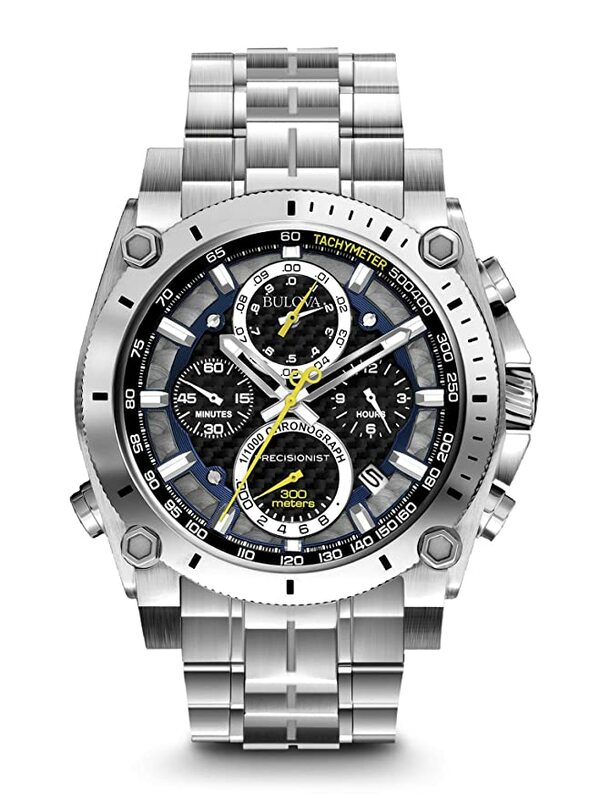 As you could guess by the name, the Precisionist series of watches by Bulova is known for their stunning accuracy. It features a new type of higher frequency crystal which operates at 262,144 Hz, eight times the standard in the industry! 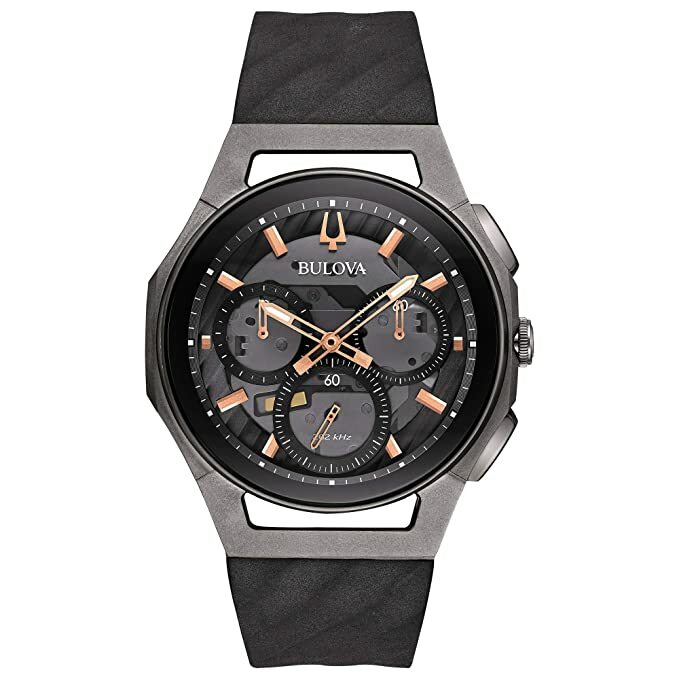 I personally own a stainless steel chronograph by Bulova from the Precisionist series, but you can have a large variety of choices when it comes to style, materials and face shapes. This one was actually gifted to me by my wife very recently for my birthday, and honestly, it was love at first sight! Chronographs have always been my thing, and Devil Diver is everything that you’d expect out of a good chronograph. Plus, it has quite a lot of history behind it. The name “Devil Diver” is inspired by the 666 feet water resistance rating printed on the dial of the watch. This iconic timepiece is actually a tribute to the legendary 1970s Oceanographer watches. It features a sleek black dial alongside a 44mm case box, sapphire crystal with anti-blue reflective coating and a double-press fold over buckle. 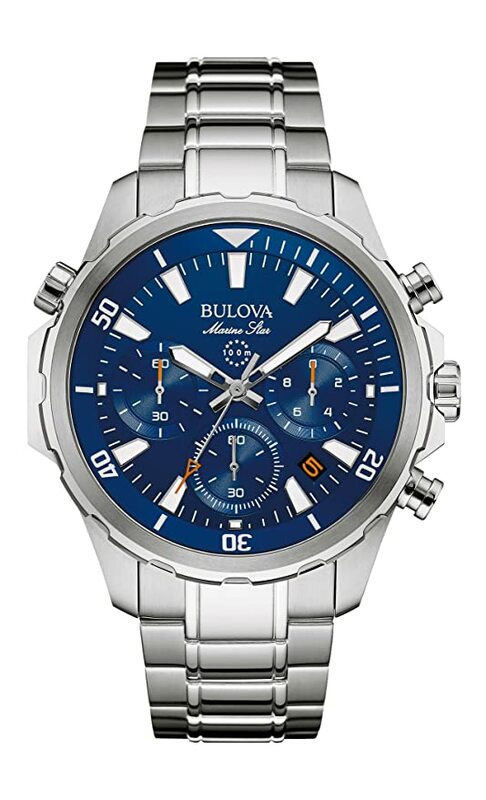 If you’re a fan of chronographs, I highly recommend the “Devil Diver” by Bulova. At this price point, this watch is way ahead of its competition. 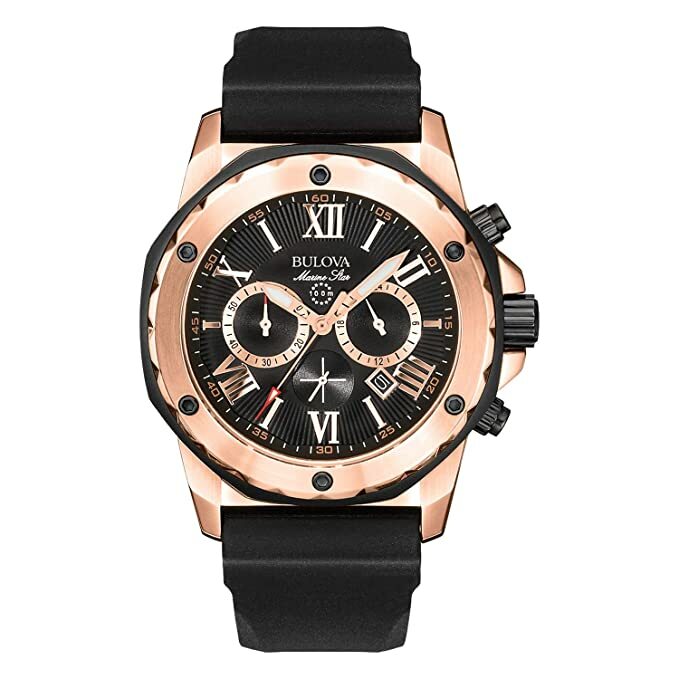 The Marine Star Collection by Bulova is probably their most popular range of watches at the mid-tier price range. I’ve had the chance to test out a lot of the models from the Marine Star Series, all of which are sleek looking chronographs. 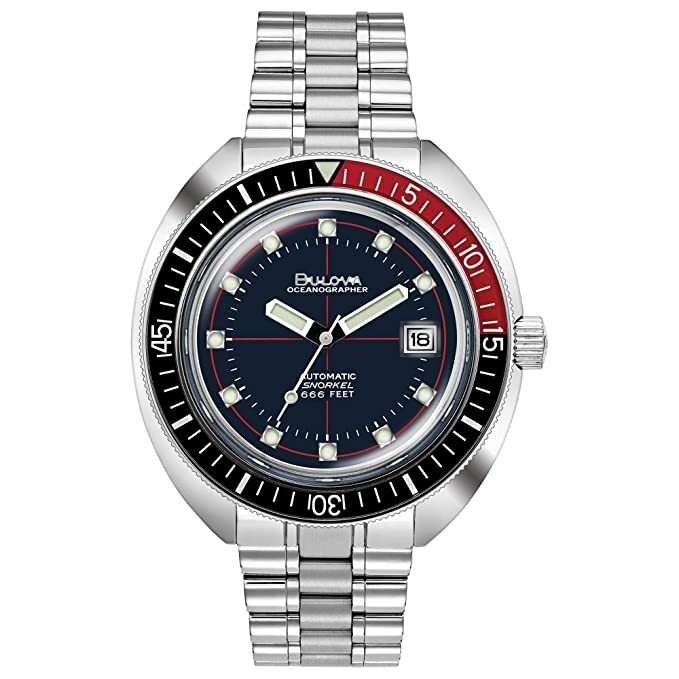 Out of all the models that I’ve tested out, the Bulova Marine Star 96B256 always stood out to me as the most aesthetically pleasing. However, depending on your tastes, there are a lot of different models for you to choose from. The Marine Star 96B256 features a blue metallic dial which comes with a beautiful metallic sunburst effect, giving the watch an impressive “diver’s watch” look. However, with a water-resistance rating of only 100m, these are far from diving watches and I highly recommend you don’t use it for diving purposes! The stainless steel casing of this watch has a diameter of 43mm, and the dial features big index markers and sword hands that maximize visibility. The Marine Star watches by Bulova are all extremely well-built, and come with a warranty period of 3 years! 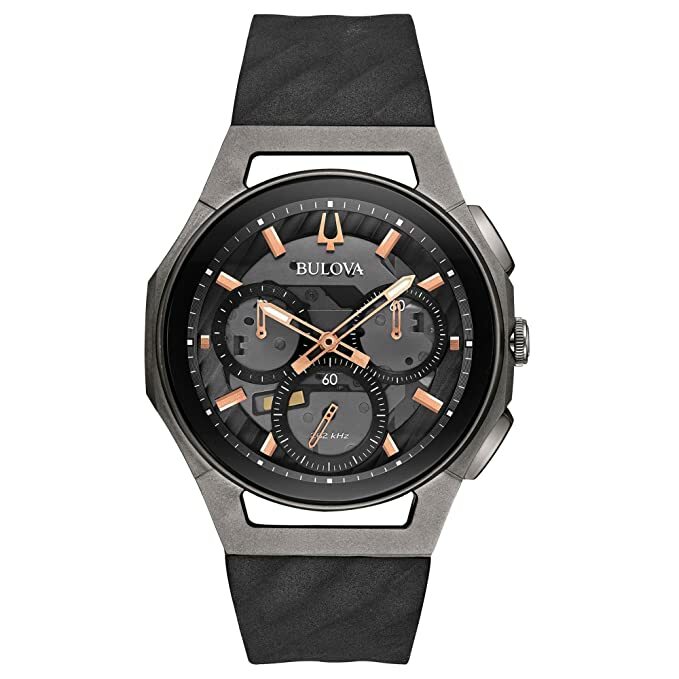 Although I do not own any of Bulova’s CURV Series watches, I am definitely ordering one now that I’ve had the chance to test them out. These watches have simply blown my mind with their incredible design and the domed movement. With the launch of the CURV Series, Bulova has managed to add yet another entry to their long list of achievements by introducing the world’s first curved chronograph movement! The CURV Series watches by Bulova feature a bent structure that is unique to these watches by the brand. The aesthetics of these watches are simply mind-blowing, and they are definitely a marvel of technical engineering! 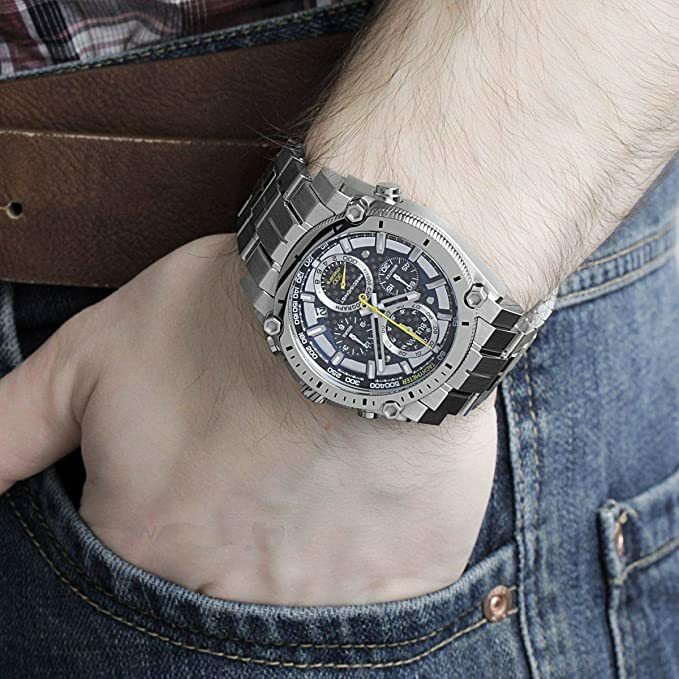 The CURV style 98A162, which is definitely my top-pick from the series, is a five-hand titanium chronograph that comes in a stainless steel case and features a dark grey exhibition dial. The dark grey dial of the watch is further accentuated by the rose-gold toned accents and the curved sapphire glass with black metallization. This watch also features the one-of-a-kind high-performance Quartz Curv Chronograph movement and comes with a water resistance rating of 30m. The Moon Watch Series by Bulova are some of their most historically significant timepieces. These watches were created by the company to pay homage to the original Bulova Moon Watch – the one which was created for David Scott, the commander of the Apollo 15 mission in 1971. Every timepiece from the Moon Watch Series by Bulova has etchings on their backsides to tell stories about the Apollo Mission! While the original Moon Watch worn by David Scott was sold for $1.6 Million, the Moon Watch Collection by the company is far more affordable with most coming with a sub-$1000 price tag. The Moon Watch Collection by the company features the brand’s signature Precisionist Movement which is one of the most accurate movements developed till date. The build quality of the watches is outstanding, featuring 45mm matte finished stainless steel cases and a contrasting black dial with lumed white minerals. These are some of the most sophisticated chronographs to go for if you’re looking for one under a $1000 price tag! Bulova is one of the most iconic manufacturers of watches in recent times, and it’s a brand that I trust highly. 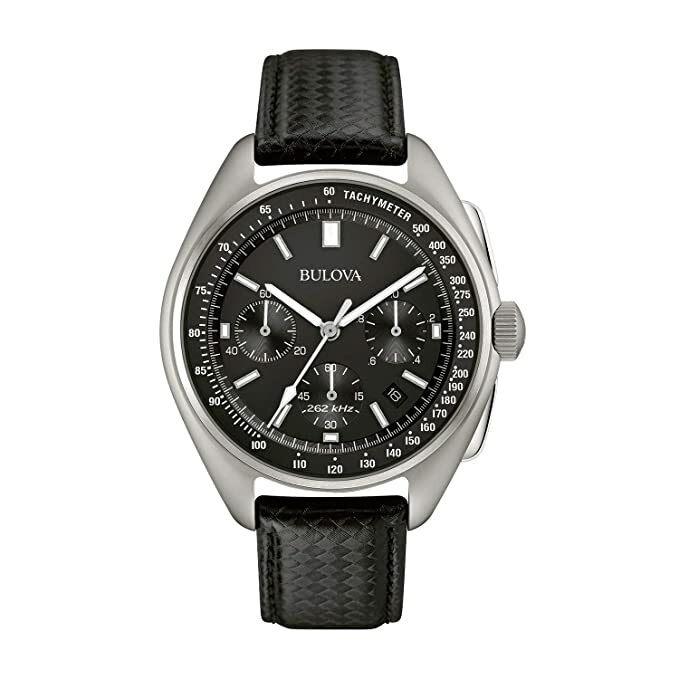 If you’re looking to get a watch in the mid-price range, Bulova has got plenty of variety for you to choose from. From classy analogs to some of the sleekest looking chronographs, you can have it all at under a $1000 price tag.